Quality handcrafted footwear that transcends the seasons. 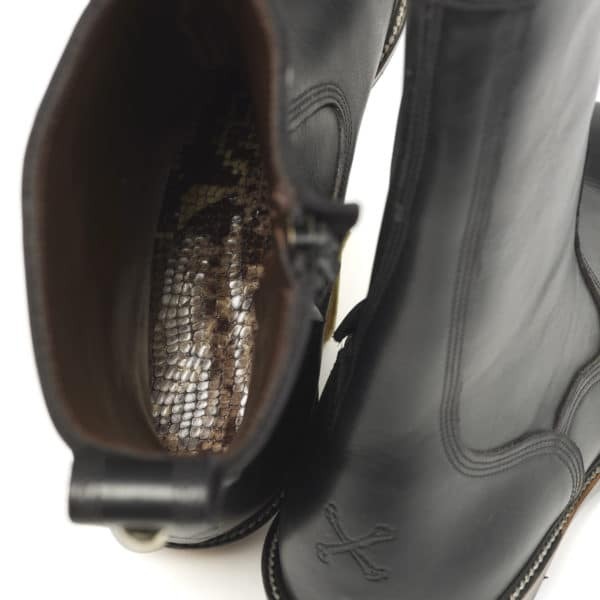 Midnight black British bovine leather upper and hand-blocked vamp with a soft dark brown lining and embossed snakeskin print sock. 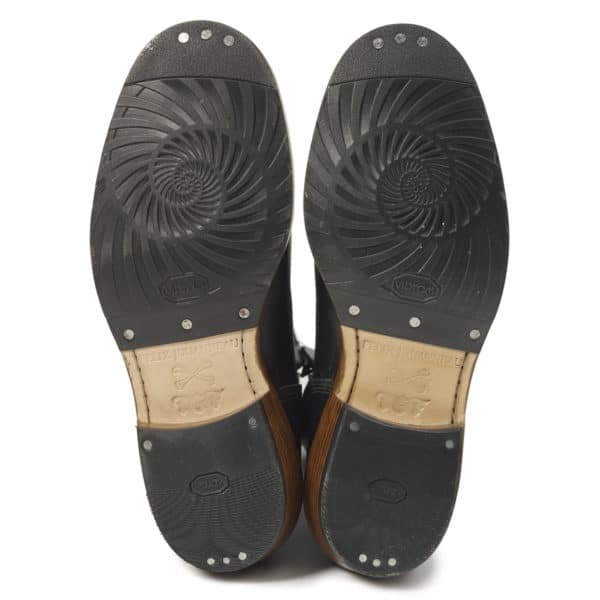 The sole is hand-stacked and made with premium vegetable-tanned soling leather, burnished by hand with natural beeswax and complete with Vibram psychedelic grip to protect the sole. Built to last and crafted with care using traditional boot making techniques. 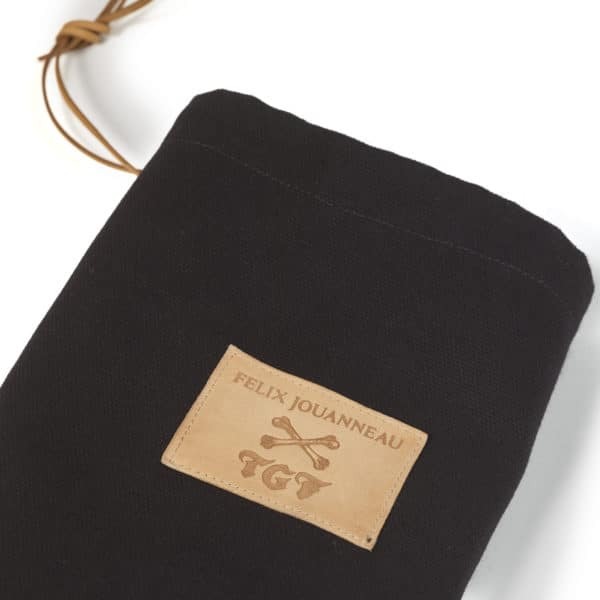 Every pair is made by Felix in his small atelier in east London. 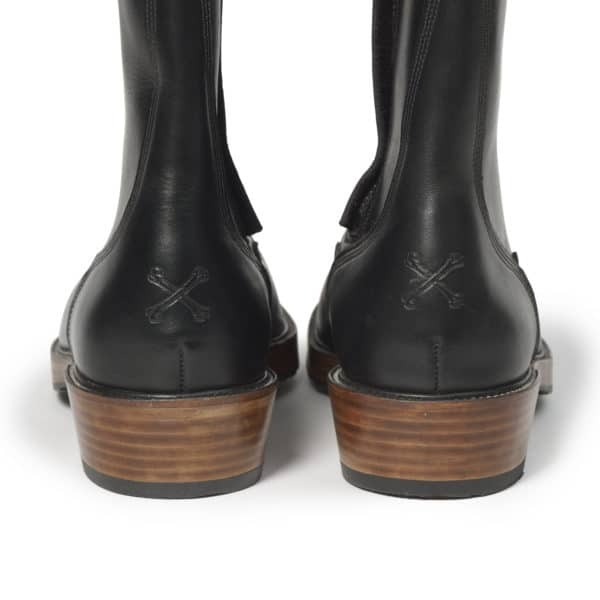 TGF: Where are the boots made? 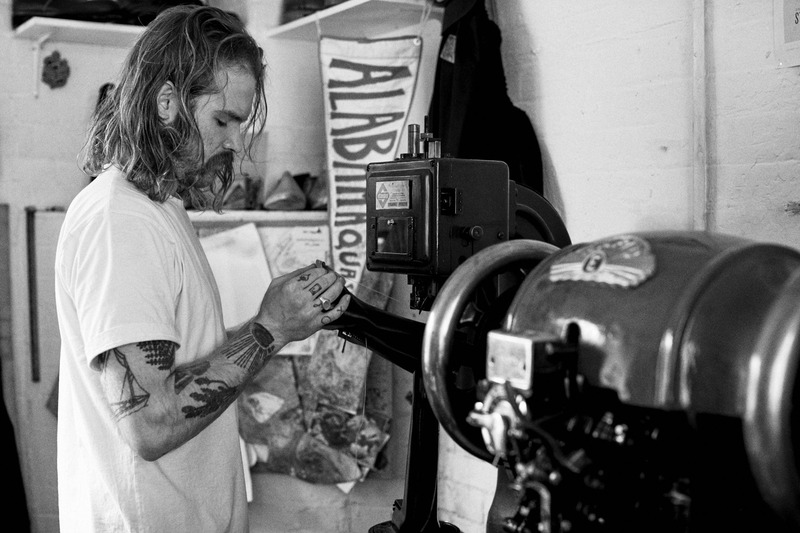 Felix: In my workshop in Shoreditch. TGF: What are your boots made of? 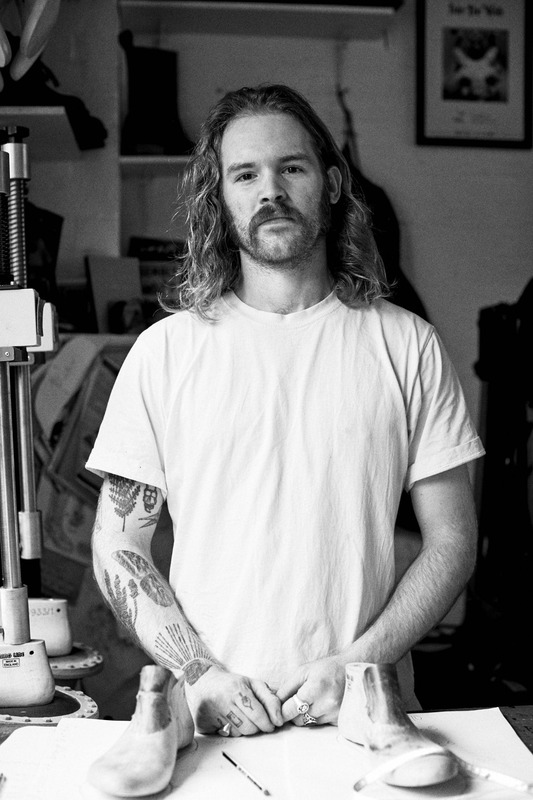 Felix: As a small scale business, I often don’t meet the tanneries mininums and am pleased to work with AA Crack – a British leather supplier – renowned for carrying the best quality leather in the UK. 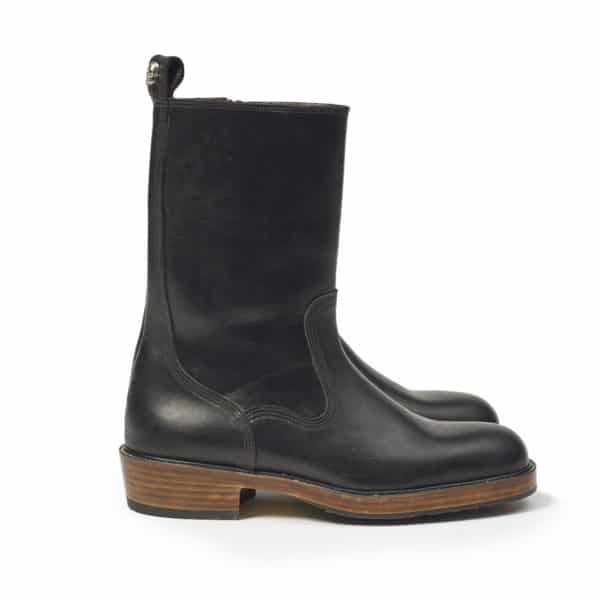 Most of the boots are made from cowhide or horsehide depending on the style of the boots. Most of my leathers come from Horween in the USA which are well renown for their quality. When I can afford it, I like to use leathers from the French Tanneries du Puy which is owned by Hermes. I use these tanneries so I can get the best quality materials as a good leather gives me the best possible start to give me a very good quality boot. I mainly use leather for the soles to give a traditional look, which is then protected with a rubber base to give grip and make them wear for longer. I use rubber from a companies such as Vibram and DR Sole who are renowned for their quality and excellent grip. TGF: How long does a boot take to make? TGF: What is your favourite feature of the boot you have created for us? 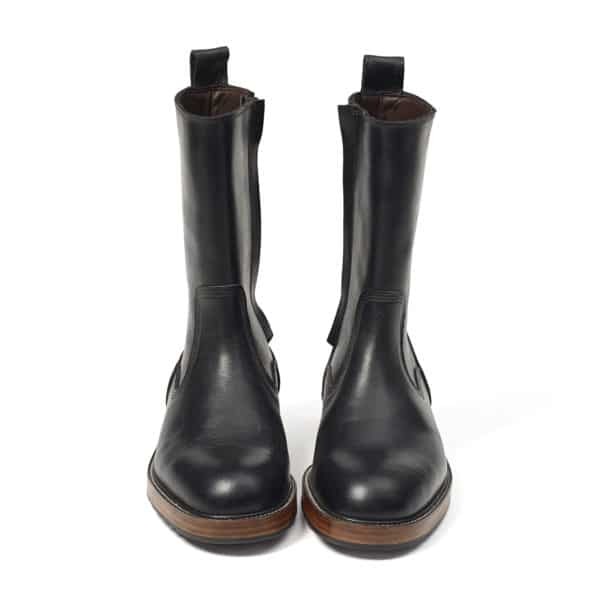 Felix: My favourite feature of the boot is the double stack leather sole with the slight cuban heel, I hand wax the soles with an edge iron to give that deep tan brown look. 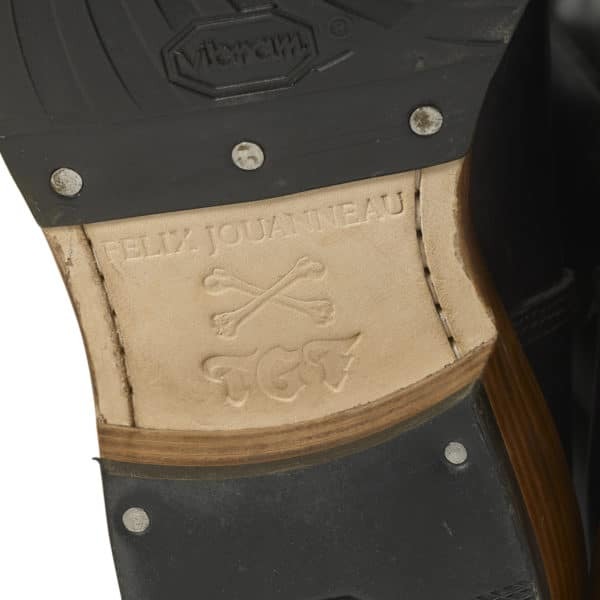 I really like the additions that The Great Frog have done like the crossbones embossed onto the heel and the silver skull fixtures. TGF: How long have you been in this industry? Felix: I have been making shoes for 7 years. TGF: What first interested you in this trade, and what inspired the TGF collaboration? Felix: I visited Florence, Italy, about 8 years ago after quitting my chef job and saw a shoemaker making traditional bespoke shoes. I was really impressed and felt I had to do something like that. I met Reino through Black Skulls and at The Trip Out. We got talking about making a boot together and adding some killer silver to it to make something unique and interesting that would look cool and last the test of time. 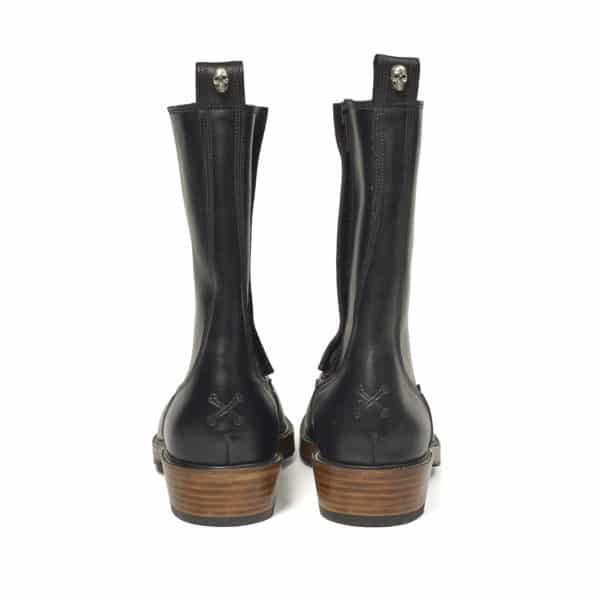 I have always liked the rock ‘n’ roll and biker image/mentality of The Great Frog and thought the boots would sit well with a company that shared the same hand-making to order all of their products to get the best result and uniqueness to each of their products. TGF: What is the measuring process to ensure a good custom fit? Felix: The best way to ensure the perfect fit of boots is to take the crucial measurements of the joints of the foot and building the last to ensure enough room for those crucial areas in the foot. Most of the comfort comes from using good quality leathers and making the shoes by hand so you are not over stretching the leather.